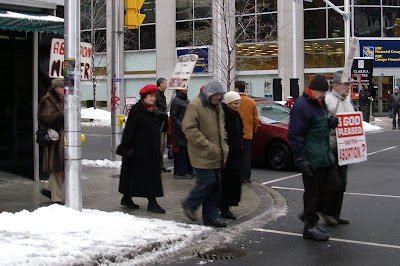 This afternoon, on the way to work, I happened upon a curious sight: an anti-abortion march. It caught me off guard, and my initial reaction was to laugh. Out loud. Still incredulous, I then turned my bike around to take photos. I'm not really sure why. I guess I've never seen an anti-abortion march before. I mean, I've seen a block-long poster session along Bank Street (which I didn't consider worthy of a photograph), and I've seen that guy who sits on the lawn in front of Parliament Hill with photos of a distended foetus, (which I did). But never a march. It must have been the surreality of the participants. Six people, all white, all over 60 years of age. Four were male, two female, and all marching peacefully and silently. It must have been the one in the back that got to me. Don't be fooled by the purse or the fur coat--it is a man. His sign--"Abortion is Murder"--was the icing on the cake. I'm so used to the stereotypical "Fur Is Murder" protest slogan that I just couldn't help but be amused by the sight of a man holding a "______ is murder" sign while wearing a fur coat. The "Morgentaler clinic is Sparks St. Mall's Auschwitz" sign was also quite audacious. Many a letter-writing campaign has been sparked simply because someone used the word "holocaust" to refer to any genocide other than "The" holocaust, so I'd expect a much grander outrage at the term being used to refer to a mere abortion clinic. Maybe the backroom censors combing through my blog for anti-semitic sentiments can tip off the Political Correctness League on these folks? I can only assume these people are making the connection to Morgentaler, who himself survived Auschwitz in World War II (according to Wikipedia), and aren't simply making a facile hyperbolic assertion. I reacted to the protest by laughing. But what might a sane, logical reaction be? To that, I turn to a radio interview on CHUO's The Train with Andrew Nellis from July 19, 2007. I managed to download the hour-long podcast back while it was still available on the Internet Archive (I'd re-post the CC-licensed podcast here if it weren't 30 MB). [0:30:11] Now I'm probably going to get in trouble here, but, you know, I have to tell you, I don't like abortion. I think abortion is a very selfish choice. But you know what? I'm never going to have to have one, and I will fight for any person's right to have one, because that's their choice. [Abortion] may be a wrong choice, but it's their wrong choice to make--not mine. I'll tell you something else: when I see anti-abortion protesters out there, I go over and I shake their hand, because if these people really believe that it's murder occurring in these clinics, I don't understand why there aren't millions of people out there protesting. You know, I think it's alarming, I think it's absolutely damning that these people think murder is occurring and they can't even be bothered to go out and do anything about it. I certainly had this near the front of my mind when I saw that protest, but I was too overtaken by the protest's whimsical self-parody to let it bother me. I respect these people's right to protest, but I would never shake their hand: all too often, abortion opponents aim to remove--as Andrew puts it--the right to make a "wrong" choice. Tonight was one of those nights where I had to do the laundry if I wanted to have anything clean to wear tomorrow. So I went to the laundromat down the block and put my clothes in the washer, then came back home while the cycle was going. It wasn't until after I had taken off my winter boots and jacket that I remembered I wanted to go to the corner store to get a particular style of chips. Since I was fairly warm and needed to cool off, I just went out with my walking shoes, my sweater, and a fleece hat. The corner store didn't have the chips I wanted, because the delivery truck was delayed from the snowstorm. 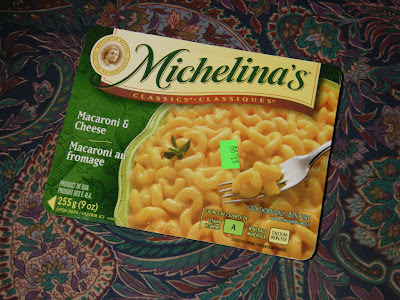 So I got a frozen dinner instead. The price on the label was $1.99. When I got back to my place, I realized that I had left my keys in my jacket. The jacket I wasn't wearing. Crap. I rang the neighbour's doorbell to get him to let me in to the building, to no avail. Luckily, I did have my cell phone on me, so I tried calling the landlord. But between no answer at home and his office door not being cleared of snow for the last couple days, I concluded that he wasn't around. Crapcrapcrap. After dropping my frozen dinner box into the snowed-over recycling bin by my front door (in this weather, I don't have to worry about it thawing! ), I stepped in to the pizza place next door to "wait". What for, I don't quite recall, but maybe it was just so I could collect my thoughts. Collect them I did, as I remembered that I had a load of laundry going. I headed to the laundromat to put my clothes into the dryer as I pondered further. I remembered that I hadn't tried calling my landlord's cell phone. So I called it on a lark. Success! He answered! He said it wouldn't bother him at all to come over to unlock my front door...only he's out of town. Out of town! I had anticipated this, so I realized that my only reasonable option was to call a locksmith. So I did, and I waited next door for him to come. One interesting thing he asked me is if I had called another locksmith, as apparently some people call a bunch of them in hopes that one will come earlier than the others. This I had not done. He did finally come, and it took him less than a minute to open my front door. As I got into my apartment (the door of which I had left unlocked for the "brief" trip to the corner store), I put on my jacket and asked him how much I owed him. Yowza! I was expecting $40 or so, but sixty? Oh, well. So I grabbed my wallet. Shucks, because all the cash I had on me was twenty five bucks and a bunch of laundry change. He was kind enough to drive me to the nearest bank machine, so I wouldn't have to pay the exorbitant charges for using a white-label machine. He couldn't drive me back, but that's fine, as I had my jacket (though no scarf or gloves...brrr). I got inside, and put my frozen dinner into the microwave. It didn't taste like it was worth $62, but I sure felt good when I finally got to eat it! Going home tonight, I stopped by the Somerset House site, and noticed some changes. There were Jersey barriers around the site, and some of the barricades had been removed. Sure enough, at around 11pm, an article appears on the Citizen's website announcing this intersection will re-open. 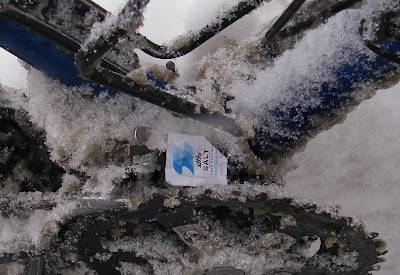 Winter cycling tip: As you can see in the photo below, salt on your chain is pretty unavoidable. Try to keep your chain well lubricated and free of salt so that it will not corrode. You read in the news that businesses in the Somerset/Bank area are doing poorly because of the road closures and barricades set up around the Somerset House building, which the City claims is structurally unsound. But yesterday, when I got some items from Hartman's grocery store, it was packed. Shoppers not only had to deal with the road closures, but also the 20-40 centimetres of snow on the ground, too. "About a half-dozen local business owners" staged a protest on November 24th on the City's inaction. And even though "about a half-dozen" means five-to-seven, they managed to score a 440-word article in the Citizen, complete with photo. Many protests with far more participants and better coordination barely get any mention (much less a photo) in the Citizen. Looking closely at that photo, the lady with the bullhorn is not a "local business owner", but homeless advocate Jane Scharf, who I strongly doubt was protesting the same thing. While the owner of the building might have cut a lot of corners (perhaps all of them), it would be a lot cheaper for him to tear it down. His resistance to tearing it down shows how highly he values the charismatic 105-year-old building. It is far more attractive than any box of bricks that could replace it, and it would be a shame to let it go for others' impatience.